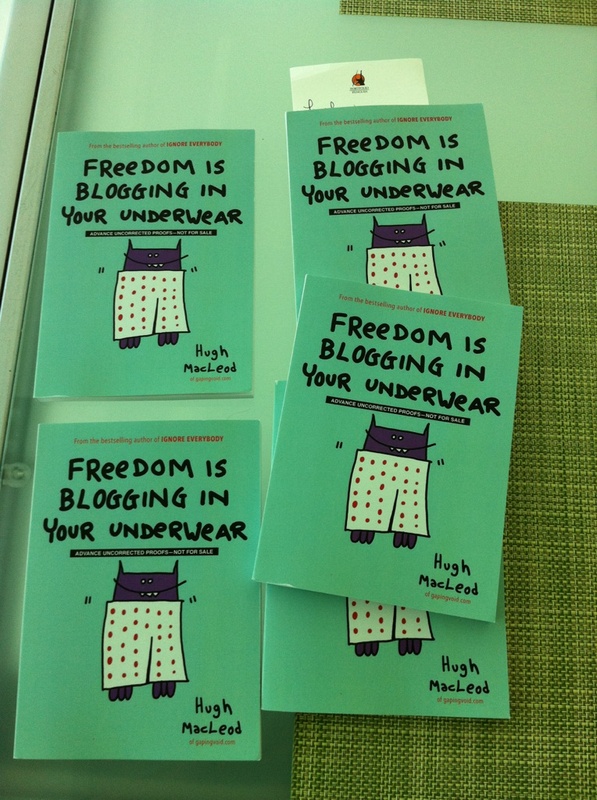 Home / Freedom is Blogging in Your Underwear / My next book… and some personal thoughts on the future of the economy. My next book… and some personal thoughts on the future of the economy. I already broke the news on Twitter a while back, but yeah, gapingvoid Book Number Three comes out in April [Amazon pre-order link here]. It’s also very, very short. I was in Brevity Mode at the time. And I made sure to put lots of new cartoons in there, just like last time. I also didn’t write it for the “social media pundit” yakkin’ crowd. I wrote it for your Cousin Al, something just to plant a seed in his head. Hopefully one day it’ll sprout something. What’s really interesting to me about the book is the timing. In a year where you can’t turn on the news without some pundit asking, “Where are all the new jobs are going to come from”, this might hint at a good answer, of sorts. Because the way the economy is evolving, the new jobs are going to come from people who are predisposed to blogging in their underwear, anyway. The people who quit their dead-end, pen-pushing jobs, got a second mortgage, turned their spare bedroom into an office and basically risked everything to pursue their dream. And started a blog to help get the word out. The people who don’t have to wear an tie and go to endless boring meetings seven hours a day for a living. The people who actually MAKE stuff. The people who actually create real, thriving businesses from scratch. Up and at ’em by six a.m. Before they’ve had their first cup of coffee. In their underwear. Exactly. And thanks to blogging social media, beginning that adventure is far less lonely and daunting a process than it used to be, THANK GOD. Closely related, my regular Twitter buddy, Umair has a WONDERFUL little post over on the Harvard Business Review, “Create A Meanigful Life Through Meaningful Work” where he laments about how most “successful” people he meets seem to make a living these days. As usual, he pulls no punches- he suggests that maybe, just maybe our current depression is not an economic one, but a spiritual and psychological one. I’ve been in Manhattan for the last few weeks. Hanging out in all the wrong places (read: painfully hip power hotels), I’ve had the questionable privilege of overhearing more than my fair share of Very Serious Conversations from the movers and shakers of the world. And boy, have they been tedious: mostly, about eking out slightly sharper terms for deals for more yawn-inducing stuff (whether flicks, financial instruments, or kicks) that’s destined not to matter. So here’s a tiny hypothesis: maybe the real depression we’ve got to contend with isn’t merely one of how much economic output we’re generating — but what we’re putting out there, and why. Call it a depression of human potential, a tale of human significance being willfully squandered (on, for example, stuff like this). Bravo, Umair! My thoughts exactly. Like the brilliant Guy Kawasaki once famously said, “Make Meaning”. That is where the action is, that is where the economy AND the future is going. For all of us, rich and poor. 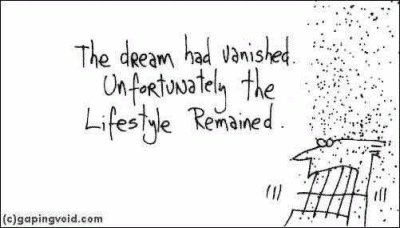 Greeting Cards… Now Unavailable At gapingvoid! Congrats for your new book, Hugh ! I see a future where every solo-creative entrepreneur is sitting in their pants, in front of the PC and creating awesome art for the whole wide world. he sug­gests that maybe, just maybe our current depres­sion is not an eco­no­mic one, but a spi­ri­tual and psycho­lo­gi­cal one. Oh ANd I’ll buy yer book. Congrats on making enough dough so you can actually focus on making some art with a somewhat clear and failry fed…head….ha. Seriously..thats one of my simple goals in life. rock on. I’m sure it’ll give many people permission to do the same. All the ground-breaking “how to” blogging books were written years ago- “Naked Conversations” etc. I didn’t want to do that… Like I said, I wanted something very personal that, God Willing, might plant a seed or two in somebody’s head, unexpectedly. I doubt this book will impress the pro-blogger scene much, but that was’t the point of it…. This is the last thing our world needs, just another cook-book. Indeed, people need to be touched in their core, they need to melt their ‘factory mindset’ and tap deep within them for their art. Thank you for shipping yours! Underpants is outside clothes !! Thank you for writing another one. Good idea, I just pre-ordered a hard copy as well. Agree about the Howto, I have that pretty well dealt with. Staying inspired is now top job. Probably should take a vacation. Thanks for inspiring people to utilize the Internet as a platform for free expression. I myself, recently dove into the blogging business. Much success to you, love your pictures!! !